Paparazzi! 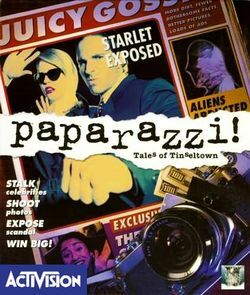 Tales of Tinseltown is a 1995 adventure simulation developed by Museworthy and published by Activision. The object of the game is to take photos of 24 celebrities in Tinseltown, in some sort of compromising position. The photos can (but do not have to be) sold to various publications, ranging from sleazy tabloids to well-respected magazines. Each "day" of game time has a "day" and a "night" period. Each period gives you the chance to go to two different places in order to take photos. There are less than 14 total days, so you have to take photos on many of your trips out in order to complete your assignment. This is complicated by the fact that some of the celebrities are only in certain places at certain times on certain days. If you miss the right place and time, you miss the photo. Adding to the complication is the fact that "exactly" the right photo must be taken of the celebrity in order to count. You may shoot up to two photos at each location you visit, which makes your film very precious. Watch all programs on all channels of the TV, once every day and once every night (they do change). Some of the programs provide hints as to where the celebrities will be, and when. If you miss the hint, you'll miss the photo opportunity. Check your messages, once every day and once every night (they do change). The phone calls sometimes include tips to finding a celebrity, advice on game play, etc. When you have nothing else to do, go to Cheever's Camera Shop during the day and to the Blue Fug at night. These places abound with hints, tips, etc. The following walkthrough contains the list of TV programs appearing on all channels, the list of messages on your answering machine, and the places you should go during each time period of each day. If there is no specific place you should go, it will say "Go anywhere." which means you can visit any location you like. You may find some amusing things going on at some places, though probably nothing worth shooting. Note that you also have to watch your reputation. If it gets too bad, people won't be friendly with you, won't let you in places, etc. Your reputation can be negatively affected by selling your photos at all in some cases, and by selling them to sleazier publications who misuse them. You can improve your reputation by selling certain photos to certain publications, or by selling them to the FIB as evidence. This page was last edited on 13 August 2008, at 01:49.